Roger Griswold was a lawyer, judge, and politician who spent the better part of his life in service to Connecticut. The son of a Connecticut governor, Griswold, himself, served as governor of Connecticut and was the grandfather of Matthew Griswold, a 19th-century member of the US House of Representatives. While rendering invaluable service to his country in the years leading up to the War of 1812, Griswold may be most famous for his physical altercation with a fellow member of Congress on the floor of the House of Representatives. Griswold was born in Lyme, Connecticut, on May 21, 1762. The son of future Connecticut governor, Matthew Griswold, Roger graduated from Yale in 1780 and began studying law. Admitted to the bar in 1783, he practiced in Norwich before returning to Lyme in the decade that followed. In 1795 he began a 10-year period of service in the US House of Representatives. 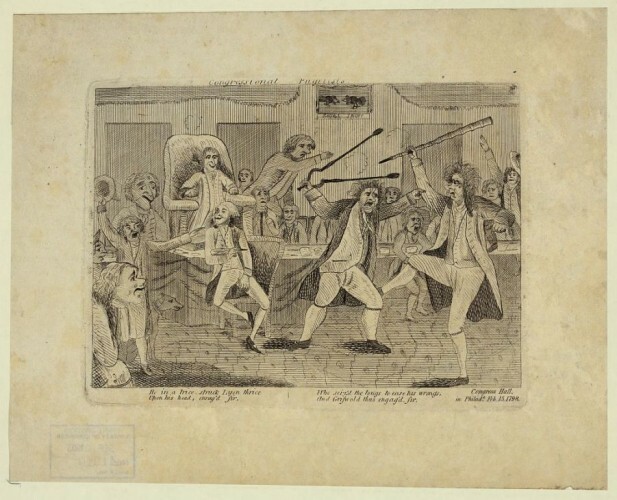 Three years later, a simmering feud between Griswold and Representative Matthew Lyon of Vermont erupted in violence as Griswold used his hickory walking stick to assault Lyon on the floor of the House of Representatives. Lyon retaliated by landing several blows with a pair of fireplace tongs before other members of Congress stepped in to break up the fight. While a member of Congress, Griswold served on the Committee of Ways and Means and as chairman of the Committee on Revisal and Unfinished Business. In 1801, President John Adams asked Griswold to serve as US Secretary of War. Griswold turned down the offer, however, and ended his career on the national stage by resigning from Congress 4 years later. In 1807, he reentered public life in Connecticut by serving on the benches of the Connecticut Supreme and Superior Courts. The death of Governor Jonathan Trumbull led to Griswold’s election as the state’s lieutenant governor in 1809. Two years later, Griswold became governor of Connecticut. Elected to a second term in the spring of 1812, Griswold’s administration faced the difficult task of charting Connecticut’s course through the political debates surrounding war with Great Britain. Griswold personally opposed the war and refused to place the Connecticut militia under the control of the national government. Steadfast in his convictions, Griswold continued to rebuff federal requests for troops right up until his death on October 25, 1812. “Finding Aid to the Roger Griswold Papers.” Connecticut Historical Society, 2013. Link. “Finding Aid to the Roger Griswold Papers.” Yale University Library, Manuscripts and Archives, Sterling Memorial Library, 2013. Link.